Before following all the steps outlined below, ensure first to reload your inbox and and clear your cache (using Ctrl + Shift + R on Windows or Cmd + Shift + R on a Mac). This will ensure you run the latest version of our software. 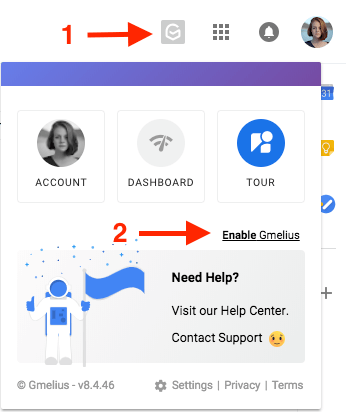 When the size of your screen is too small and/or a large number of Gmelius features are enabled, you can find the Gmelius icons by clicking the menu button, as shown below. If the answer to point 1) is yes, remove your current copy of Gmelius and re-install one from our website. If the answer is no, install Gmelius. Click on Manage Apps and remove Gmelius if found. Finally, clear your local data and reload your inbox. One of your installed extensions may enter into conflict with Gmelius. Please see this article for more details. If you notice that Gmelius is loading on your home computer, but not on your work computer, this is probably due to your firewall configuration. You can whitelist *.gmelius.io *.firebase.com and *.firebaseio.com on port 443. Feel free to ask your network's administrator to whitelist the latter domains.